If you are driven by the passion to succeed, we have the right platform for your business. 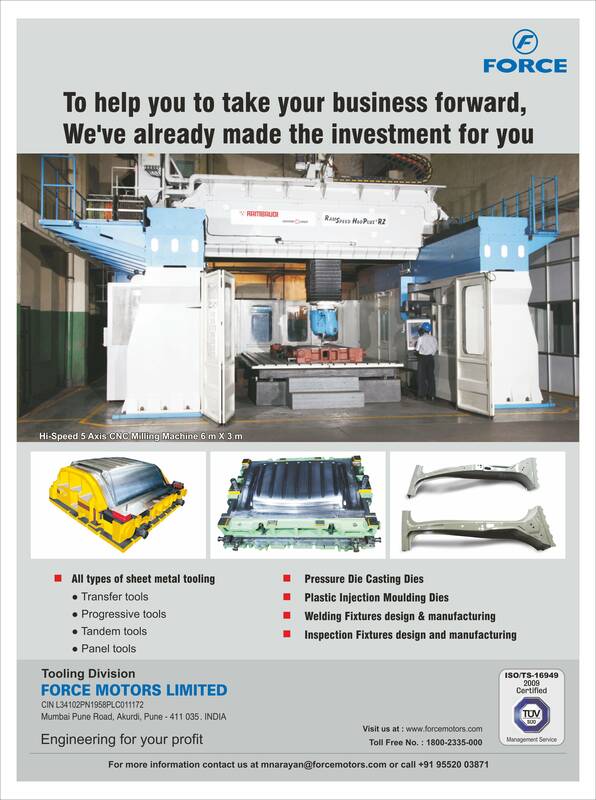 By choosing the Tooling Division of Force Motors, you partner with one of the largest Tool Rooms in India, so that your business can grow as big as your dreams. Our Tool Room is equipped with a battery of state-of-the-art machines to guarantee superior quality as well as sizeable outputs. We also have an edge over our competitors as we are backed by decades of experience in designing and manufacturing tooling for the full range of automotive components. Our large design infrastructure is powered by the most advanced hardware and software resources and aptly manned by a team of over 400 highly skilled professionals. With all this and more, the Tooling Division of Force Motors ensures the success of your business. · Sheet Metal Press Tool Design, Manufacturing & Tryout. · Plastic Injection mould-Design, Manufacturing and Try out. · Welding Fixture Design, Manufacturing & Tryout. · Manufacturing of Patterns, Pattern Equipments.